정조필(正祖筆) 는 조선시대 정조(재위 1776∼1800)가 그린 국화그림이다. 정조는 시와 글에 능하였을 뿐만 아니라 그림에도 뛰어났다고 한다. 가로 51.3㎝, 세로 86.5㎝ 크기의 이 그림은 화면 왼쪽에 치우쳐 그린 바위와 풀위에 세 방향으로 나 있는 세송이의 들국화를 그렸다. 돌과 꽃잎을 묽은 먹으로, 국화잎은 짙은 먹으로 표현하여 구별하였는데, 이러한 농담 및 강약의 조화를 통하여 생동감을 느끼게 한다. 꾸밈이나 과장없이 화면을 처리한 점은 다른 화가의 그림에서 찾아볼 수 없는 특징으로 파초도(보물 제 743호)와 함께 몇 점 남지 않은 정조의 그림으로 회화사 연구에 귀중한 자료가 되고 있다. This painting titled Gukhwado (Painting of Chrysanthemums) was produced by King Jeongjo (r. 1776-1800) of the Joseon Dynasty, who excelled in poetry, writing and painting. 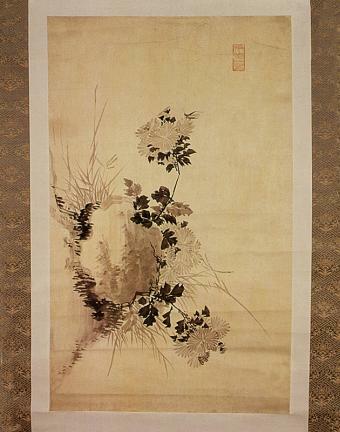 The painting, which measures 51.5 cm wide by 86.5 cm long, depicts rock and weeds on the left, and chrysanthemums blossoming outwardly in three different directions. King Jeongjo drew the rock and flower petals with a pale ink and the leaves with a thick ink, making the picture more vivid through the use of shade and variations in the strength of the ink. The painting is characterized by an attractive absence of decoration or exaggeration rarely seen in other pictures. This is one of very few paintings by King Jeongjo and as such is regarded as a precious material for studies on the history of painting, along with Pachodo (Banana Tree; Treasure No. 743), also by King Jeongjo.